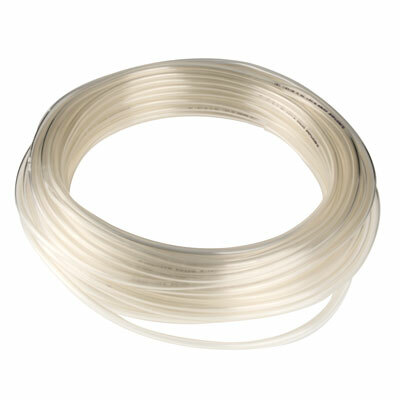 5/8" ID x 7/8" OD x 1/8" Wall Superthane® Ester Based Tubing | U.S. Plastic Corp. Resistant to oils, greases & fuels, Superthane® is commonly used in fuel applications. Polyurethane is extremely resistant to weathering, but for resistance to moisture and fungi, Superthane® Ether is recommended. This tubing can be heat sealed, coiled, fabricated, or bonded. Hydrolytic Stability - Ester polyurethane does not react well with water, prolonged humid conditions, or attack from fungus. Superthane® PU tubing is much more resistant to pressure and vacuum applications than corresponding sizes of PVC or rubber. Although polyurethane is commonly used in fuel applications, due to additives in today's gasoline and petroleum products, field testing should be performed. Superthane® is a registered trademark of NewAge® Industries.